We live in Florida. They don’t call it the sunshine state for nothing. So one of my biggest concerns outdoors with my 10 month old daughter is protection from the rays of the sun. This is something we will be dealing with quite a bit since we take daily walks with the bulldog and love to go to the ocean, I wanted to make sure I found something that worked very well. After starting my research on your average sunblocks and sunscreens, I was a little shocked by the list of poor ingredients in these bottles and sprays. I did find one that I am beyond happy with and would love to share it with my fellow light green mothers and parents. It is this product, Adorable Baby by Loving Naturals. As you may recall from a previous blog I wrote, Our Safe Sunscreen Search, there can be many ingredients in sunscreen that most likely you would rather not come into contact with. With that being said, I want to say that this product is beyond wonderful! It’s Active Ingredient is Non-Nano Zinc Oxide- at 24.7%. All other ingredients as well are very mild and 100% Natural and Organic. With broad spectrum protection from UVA and UVB rays. It is a little shiny when you put it on, so don’t expect it to just absorb in an instant, but when you have wonderful ingredients like Grape Seed oil, Sunflower oil, Cocoa and Shea butter, you are bound to have glowing skin right? I do love that it is water resistant and my 10 month old daughter doesn’t seem to mind it one bit. With most any sunblock, be sure to apply 30 minutes prior to sun exposure and be sure to rub in in until it does not appear white anymore. Also be sure to reapply after swimming, sweating and every 1-2 hours to keep your skin safe from the sun. Again, I highly recommend this product for your baby and even your family! 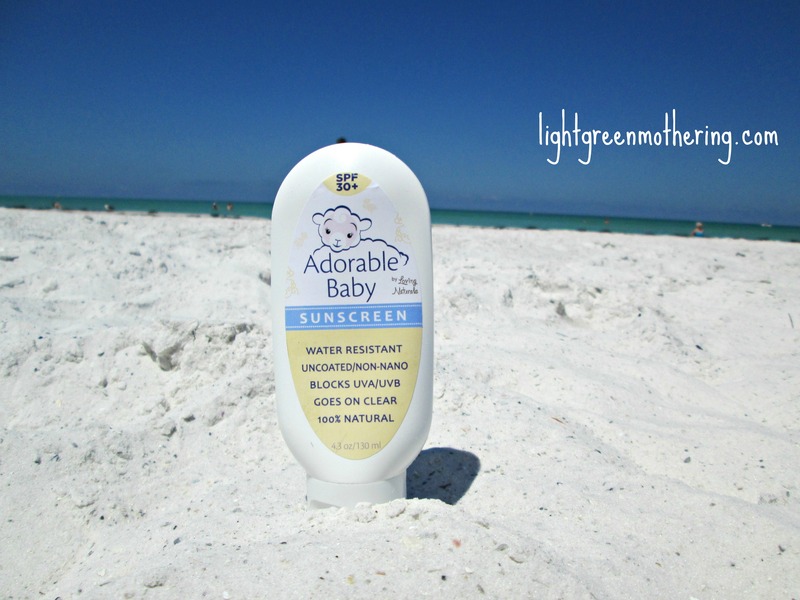 This entry was posted in lightgreen baby, lightgreen family, Reviews, Uncategorized and tagged adorable baby, baby, review, safe sunscreen, sunblock, Sunburn, sunscreen by lightgreenmom. Bookmark the permalink.